It’s university holidays again (aka “non-lecture time”), which means I’m back on the blog trying to process everything that’s happened this term. Mostly this has been me spending time with students in the Drop-In Centre, since I made a commitment to do more of what I love, which is spending time with students in the Drop-In Centre. When trying to decide what to write about first, I realised that a lot of what I wanted to say wouldn’t make much sense without talking about SQWIGLES first. So that’s what this post is about. 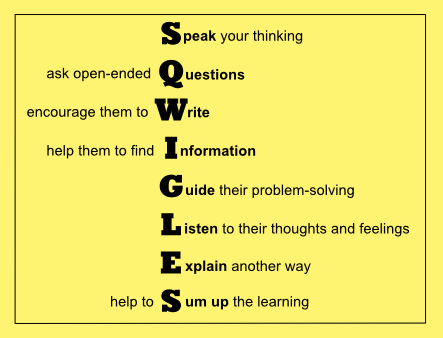 SQWIGLES is an acronym that we use to help our staff (and ourselves) when teaching in the MLC Drop-In Centre. It is a list of eight actions we can do to help make sure our interaction has a better outcome and make it more likely students will learn to be more independent. It was originally Nicholas’ idea to have something like this. He wanted something to help the staff choose what to do in the moment, and also to help them reflect on their actions and choose ways to improve. We noticed that our staff (and ourselves) needed something focused on actions rather than philosophies, because then it could be used on the fly to choose what to do. Telling staff they need to be “encouraging” or “socratic” is not all that helpful when they don’t know how to put it into action. Yet this is what many documents giving advice to tutors do. So we decided to focus on the actions instead. Back in 2013, I was away for the weekend and thought hard about what actions we could focus on and scribbled a lot in my ideas book until I came up with an acronym I could work with, and SQWIGLES was born. Over the past three years it has been remarkably good at helping our staff make improvements in their one-on-one teaching quickly, because it does focus on actions. Every time we read or write in front of the student, we must speak our thinking. In order to learn how to do this stuff themselves, they need to learn about how to think, and they can’t do that without us speaking your thinking. I have yet to meet a telepath! So, when reading student working, we can tell them what we are looking for and what we see. When reading a question to figure out how to do it, we can read it aloud and then say what our first thoughts are, including the ideas for attacking it that we are rejecting. When writing a solution to a maths problem, we can speak the decisions we are making. This may seem such a basic thing it hardly seems mentioning, but believe me it does need mentioning. Our very new staff often need reminding of this — they will do a maths problem in front of a student without speaking at all. Or they’ll sit silently staring at a new problem, clearly thinking deeply, but not letting the student know what they are thinking. Or they’ll just present an existing solution without explaining the thinking that created it. We all need reminding to speak our thinking. This action has two parts. First, we should ask the students questions, rather than just tell them stuff. Them responding means them thinking, which is much better than just watching. Second, we should ask the students open-ended questions if we can. There’s a much better chance of thinking then. Open-ended questions allow the students to tell us what they are thinking, whether it is what we were expecting or not, and so we can change our teaching accordingly. They may even surprise us by solving their problems by themselves if we give them the freedom to respond that way! Writing is a great way to record thinking, and a great way to help structure thinking. So it’s a great thing to encourage the students to write. Us writing is not going to have nearly as much of an impact on their learning as them writing! Moreover, if the goal is to learn how to solve problems, then the students need to solve problems. Us writing things for them is not going to give them this experience. Plus, everything looks easy when someone else is doing it! So encourage them to write. This is the one I have the greatest struggle with. I have to remind myself of this one constantly and use every opportunity to hand them the pencil. Students need to learn how to find the information they need for themselves. One of the most important skills they can learn at university is how to find information, rather than the information itself per se. So, we can help them learn how to find information. Moreover, if we just tell them, all they might learn is that the quickest way to get information is to ask us! For example, instead of telling students the definition, we can go and find the definition with them. If they don’t have lecture notes to look it up in, there’s always the textbook or the internet — learning how to search the internet effectively is an important skill to learn! If they want examples to inspire them, we can help them find a source of these examples. If they need instructions on the expectations for their assignment, we can help them find these instructions. Another worthwhile thing to note is that even if the student has a problem that it’s not our job to solve, we can always help them find information. At the very least we can help them find out who is the person whose job it is to help! This one is the most vague of the actions, but I really wanted to mention the problem-solving thing here! There are two ideas here: guiding is different from telling, and the problem-solving is theirs and not ours. We can tell students what to do, and we can do problem-solving for them, but it won’t achieve them learning something they can do on their own in the future. The best we can offer is guidance. We can give them signposts to point the way, like “What do all these words mean?” and “How is this thing related to that thing?” We can give encouragement. We can help them delineate smaller steps they need to follow. But we can’t do it for them. It’s their problem-solving and we can’t do it for them. This is one of the most important things on the list. We need to listen to the students. We can’t figure out what they need without listening to them. We can’t figure out where they are so we can guide them further without listening to them. We figure out what information they need to find without listening to them. We can’t choose an alternative explanation without listening to them. And we can’t convince them we care without listening to them. It’s also important to note that we’re not just listening to hear if they are correct or not — we’re listening to their thoughts and feelings. We really want to and need to know what they think and how they feel. These are so very important to their experience of learning and our decisions of how to help them learn, especially the feelings. Never underestimate the impact how they feel has on their learning, whether positive or negative feelings! This is one of the reasons why open-ended questions are so very important — it gives us something to listen to! At some point in our interactions with students, it is likely we will need to explain something. This letter is about not sticking to just one explanation or type of explanation. It is likely the student has heard at least one explanation and it hasn’t worked so far, so we need to be ready to try other ways to explain, especially if it was us who gave them the first explanation they didn’t understand! We can use a proof, or just an example. We can use an analogy, or a drawing, or play-dough, or movement. We can colour-code an existing example, or line several examples up next to each other. We can ask another student to have a go explaining it to them. There are so many options to try and the key is to keep trying, and build our repertoire of new ways to explain, and be brave in trying something new. There is also the issue of what exactly they need explaining, which might be different to what we are used to explaining. Sometimes they want the concept explained in all its mathematical detail, and sometimes they just want the general idea. Sometimes they need to feel philosophically comfortable with it, and sometimes they need to understand the mechanism of the procedure. Sometimes they need to know the acceptable ways to write it on paper. We can only know which thing they need an explanation of by asking questions and listening to the response. Most of the time, students come to us with assignment problems, and the only thing they will think about the interaction with us is that they got their problem solved. But this does not service the goal of them learning something they can do on their own. They probably did learn something, but if they don’t know they did, then how can they use it when they need to? So we can help them sum up what they learned today. At a conference once, they called this cognitive closure — a bit like grief closure, but for learning. Summing up what they’ve learned is good, but helping them to sum up what they learned is even better. Asking them what they’ve learned here, or what they can use in the future is an excellent open-ended question that will often give pleasantly surprising results. So there is SQWIGLES: a list of actions we use when we work with students one-on-one. A list of things to reflect on when we think about our one-on-one teaching. Try using them in your own teaching and reflection. This entry was posted in Being a good teacher and tagged Drop-In Centre, teaching methods. Bookmark the permalink.